How do you primarily use The Big Follower? To numerically overpower an opponent's feature. To ensure that a feature remains yours. I don't ever play with or don't own Inns & Cathedrals. This week's element is THE BIG FOLLOWER (from Inns & Cathedrals [Expansion #1]). Simple mechanics were the idea behind this expansion and the Big Follower element was one of the simplest. The concept is that a Follower is worth 1 Follower, so a Big Follower is worth 2. Placement rules still apply, but once placed, it takes 2 normal Followers just to tie one of these suckers. Pretty gnarly. You can try to take over other players' features easily with one of these or use them as insurance against future takeover attempts. Oddly, though, many people just use them as a normal Follower. To each her or his own. Discuss your relationship with The Big Followers, as well as your strategies for taking advantage of this element. Well, I think the most obvious way to use it is to numerically overpower an opponent's feature - I think that is what the publishers had in mind when the big follower was created. But ensuring that a feature remains yours is also something I like to do, especially if I pull the cathedral tile early in the game and can add it to an unclaimed city - in that case, I'm almost certain to play the big follower if I have him handy. But now that I've started to play against all you top players, I've had to be more careful with the big follower, because you don't want him to get trapped. It can be a big advantage to have him in reserve at the end to add to the biggest farm. I use it mostly to overpower a city as a last resort or as an extra follower when all other are already deployed. In smaller games (base game and 2 expansions) you have to be more thoughtful where you place it, so it won't get trapped. Still, it's easy to use it to conquer an ongoing segment because of the tile configurations. On larger games, 150 tiles and up, it does not have that big of an impact as it's easier to expand the city and retaliate with your own big follower if someone tries to cut in on a project you are building. A good strategy is to enclose the city so it cannot expand and then just wait for the tile in the middle to either close off several cities or merge each section into one big city. Whichever grants you more points. These are such a good idea that they feel like an essential part of most of the games I play and it's difficult to imagine playing without them. Games without them do often feel somewhat "safer" though. In more competitive games he may as well have a bright red target painted on his chest! Physically there isn't a lot of difference between a normal follower and a large follower. I've always wondered whether this was deliberate and that the difference is supposed to be quite subtle so that you have to be watching closely to notice when you're being out-competed for something. This has been the thought of many. I myself haven't missed seeing it in play (not yet at least! ), but I know some of my co-players have. If it's bothersome you can always use a Phantom box as a large follower. But I like it being subtle. I think the difference is large enough to avoid confusion. The big follower and the mayor are closer in appearance and harder to tell apart. Now you can play at a distance... from the moon! It looks like they've stopped doing them now but they used to be their "Colossal Meeples". 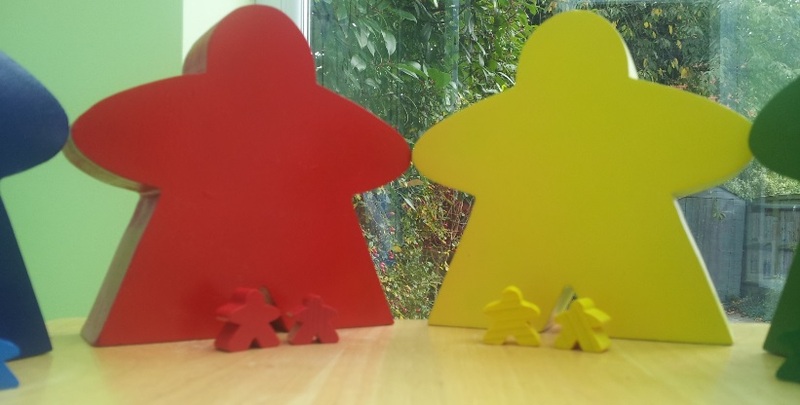 You can still buy "Giant Meeples" though which are pretty big (too big to play with but they look cool). I have a couple of them on my desk at work. In other words, I love the concept of the Big Follower, I just stink at properly implementing it...or any other similar figure. Big followers are brilliant. Nice new element of feature stealing (which, let's be honest, is their main use!) that you can use exactly as would be done with a normal follower, in trying to join two incomplete features. It's not a sneaky way of stealing like with a flyer or from the City of Carcassonne (Count), the player knows exactly what you're trying to do the moment you lay down your big follower. It does get me in trouble though. Playing a regular follower to muscle in on someone's feature is tedious for them, but I find the people I play with don't mind too much because at least you'll both score. Lay down a big follower though, and that's insult to injury!